Plasma Enhanced Chemical Vapor Deposition occurs when volatile, and inert gas precursors are introduced through an upper showerhead. A Plasma is created which causes a chemical reaction, and a film is then deposited on the substrate surface that is heated by a chuck. 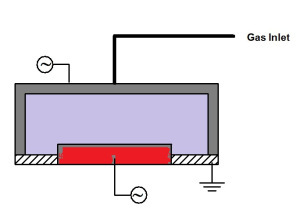 The Stress of the deposited film can be controlled by creating a plasma by using High Frequency RF power to the upper electrode, or Low Frequency RF to the chuck.